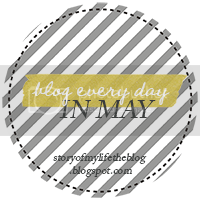 Day 14 for Tuesday, May 14th: Ten things that make you really happy. Besides the obvious big things that make my everyday world go round (Wayne, Hailey, family, friends), here are 10 little things that make me happy. 1. 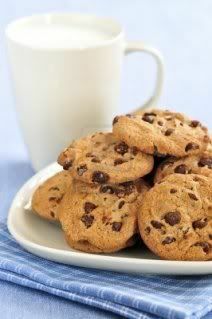 Warm Chocolate Chip Cookies accompanied with a glass of cold milk. 2. A clean house. And by "clean" I don't mean dirty, I mean picked up and organized. It just feels nice to fall asleep AND wake up in a not so chaotic environment. 3. Coming home from work (or just about anywhere) and putting on comfy clothes. Being able to roam or lounge around the house in pajamas is the best. 4. Driving with the windows down, sun shining and music blaring. 5. 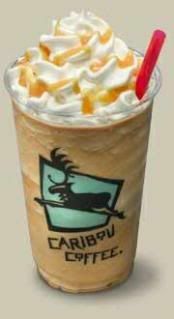 A caramel cooler from Caribou. 6. A hot shower. Nothing worse for me than a luke-warm or cold shower. That's a sure fire way of starting my day off bad. 7. Cuddles with the Hubs, daughter or pups. 8. Me time after Hailey's in bed at night. Either to catch-up on my tv shows or blog. 9. Getting a compliment on my photography. 10. A fresh manicure/pedicure. It always boosts my confidence and puts me in a good mood when my nails and/or toes look good.